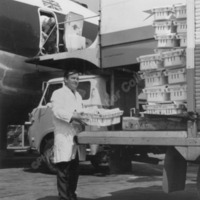 This shows David Love, Hatchery manager at Twyford, Berks from 1968 onwards. He is despatching day old breeding stock to Japan from Heathrow. With Tony Benn. 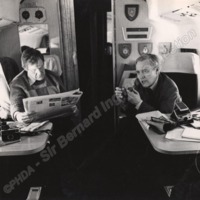 Sir Bernard was Tony Benn's PA.
About to board a light aircraft at Yeadon Airport for a flight over the Calder Valley. 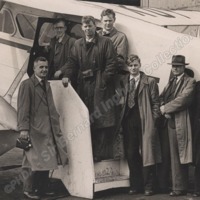 The flight was organised by Hebden Bridge Literary & Scientific Society and Bernard went as a reporter for the Hebden Bridge Times.